Now that the age of apocalypse (when all the secrets are disclosed to the public, and the origin of humanity and everything can be understood scientifically) has begun, the truth of what was believed only with mysteries and miracles can be understood scientifically. However, it makes the Creators ELOHIM sad that most of humanity still acknowledge things mystically like primitive people who lived thousands of years ago though the age of apocalypse (the age of science) has begun. In order that the purpose of the Creators ELOHIM may be realized on the earth as it was realized in the sky, humanity must be awakened from blind faith and mystery. 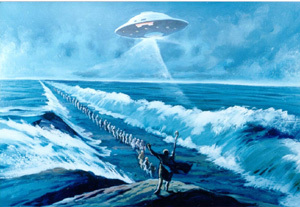 The crossing of the Red Sea of Moses and the people of Israel was made possibly by a repulsion beam which was emitted from a UFO which the Creator Yahweh was boarding. 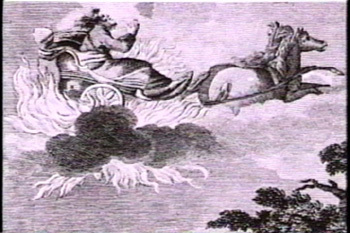 UFOs are expressed as glory, light and cloud in the Bible. 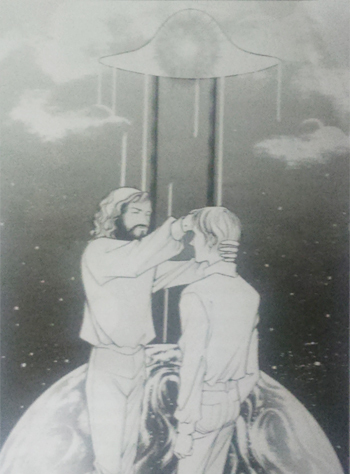 ◎ The original form of baptism is "the transmission of the cellular plan"
The enormous computer in the ELOHIIM's eternal life planet records all our actions during our life, from the time of our conception, from the meeting of the ovule and the spermatozoon, to the end of our life. 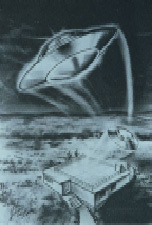 The cellular plans or genetic codes of the people who recognize the ELOHIM as the creators are registered in this computer and provide a basis for the judgement for "re-creation" on the planet of eternal life after death. This transmission is done by the Messiah Rael or a guide qualified to officiate by him.